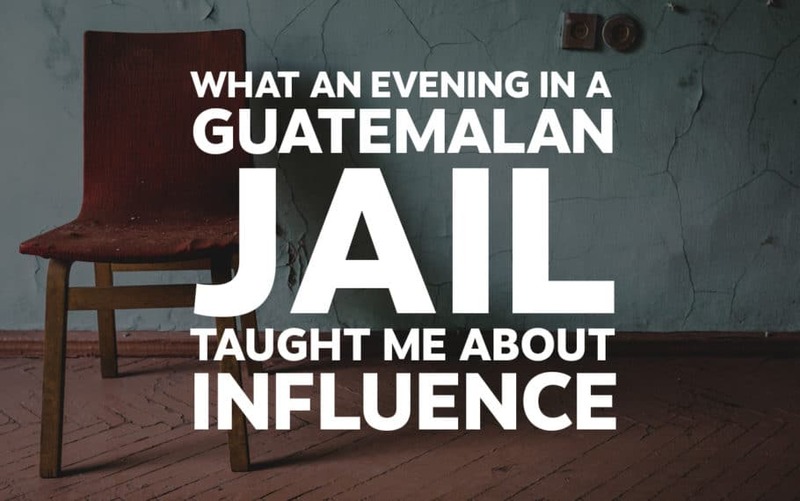 Have you ever spent an evening in a Guatemalan jail? I was rescued by a German entrepreneur who previously moonlighted doing black ops for the U.S. government and was a former member of the Hitler Youth. He then taught me the power of a sincere-yet-not-desperate request for help. Yes, this is a true story, although it has been edited for the sake of brevity. Plus, if I gave you all the details, it would only make the story that much more unbelievable, I’d have to kill you, etc. So that you’re not too worried about what I went through during this experience, I only spent a few hours in this Guatemalan jail, and I wasn’t locked up in a cell, I was in the lobby. I wasn’t even under the threat of being thrown in a cell, although my father was. It all happened in 1991 when my father took me, a young lad of 16, as well as my brother-in-law and pregnant sister, on a trip to Mexico and Guatemala to visit archeological sites. On the day of our run-in with the authorities, we had rented a car and driven to a rural area where we spent the day looking at ruins. On the way back to town that afternoon, my father was driving the car while I rode in the passenger seat. My brother-in-law was in the back seat with my pregnant sister laying across his lap, since she wasn’t feeling too well. As evening came on and the sun went down, it became dark on the roads and visibility was limited. Coming into town, we entered an intersection and as we drove straight through at full speed, a car coming the opposite direction turned left in front of us. With no time to react, our car slammed head-on into the other vehicle. We escaped with minor injuries, but the other driver didn’t fare as well. We don’t know what happened to him, but we know he was unconscious and bleeding. The law regarding auto accidents stated if there was any blood, both parties go to jail until a judge can decide the matter. My father, sister, brother in law, and I were all put in police cars and hauled off. There’s nothing like being put in the back of a police car in Guatemala at night to make you wonder what the next few hours of your life are going to be like. I’ve got an active imagination and I had heard enough about corrupt officials to make me at least a little jumpy. It didn’t help things when our convoy turned into a dark junkyard, piled high with old school buses, semi trucks, and wrecked cars, and wound through the piles of wreckage. If there were a great place to get rid of body, or hold us hostage, or scare us into giving up all our money, this seemed to be it. After a few minutes navigating the maze of retired automobiles, our line of police cars pulled up to a bright pastel green, one-story building. Paint was chipping and falling off the cracked cement walls. The roof was made of corrugated sheets of aluminum and tile. Men stood around with automatic weapons. Was this where they would hold us while they phoned my mother to demand a ransom? Nah, this was just the police station, don’t worry! Hehe, yeah, right. We were led into the front door of the jail (actually I’m not sure there was a door, it may have just been open) where we saw a fat policeman, smoking while typing up police forms on an antique typewriter at a small wooden desk with his index fingers. We turned right, walked down a hallway, and were told to sit on a wooden bench against the wall. To our right, a few dozen feet away, sat the typist. To our left and around a left-hand corner we would later find out was a hallway with the jail cells. Further down the corridor stood an armed guard with an automatic weapon, guarding the entry to another hallway that appears to contain several offices. We were informed that since the other driver was seriously injured, my father, as the driver of our vehicle, could not leave the jail until a judge reviewed the case on Monday morning. It was now Friday night. Even in Guatemala we were allowed our one phone call, so we called some friends with whom we were staying, and they told us “We know someone, hang tight.” This was hardly comforting, but better than nothing. For the next two hours we sat on the bench in that hallway, tired, slightly worried, watching camouflage-wearing guards with M-16s walk back and forth while the portly Guatemalan guard sat at his desk by the front door and pecked away. Suddenly, in walked the president of the country. My heart sank. This guy was obviously deranged and was going to get us killed. What was he going to do, single-handedly take on all the guards? Did he have a special ops team waiting outside? We had no idea what he intended to do, so we said, “Um, ok,” and sat back and watched. Gurt began negotiations by speaking with some of the guards, but at first was only able to figure out what we already knew–my father wasn’t going to be released until Monday after a judge said so. “Where is the chief of police?” Gurt asked. Gurt came over and reassured us that everything was going according to plan and we didn’t need to worry. You’ve heard it said that if you throw a frog in boiling water he’ll jump out, but if you make the water gradually warmer he’ll boil to death without knowing it? This is totally false, but nobody told Gurt that. To understand what happened next, recall what I told you about the layout of the jail. We were sitting on a bench with our backs against an inner wall of the jail. To our right was the front desk, several guards, and the front door. To our immediate left was the opening to a hallway lined with jail cells. Down the corridor we were sitting in and past that hallway with the jail cells, I could see the doors of several administrative offices. It was in one of these offices that the chief of police sat. And it was into that office Gurt intended to go. But before Gurt could get into the chief’s office, he would have to pass by a guard with an M-16 who stood in the corridor, guarding the administrative section. Gurt affected the manner of someone who is resigned to patiently waiting. He spoke casually with us, and would slowly stroll around the lobby where we sat, hands clasped behind his back, looking at the walls, the floor, and…well, there wasn’t much else. As he paced back and forth, he would move closer and closer to the guard and the offices behind him. Each time Gurt came close to the guard, the guard would stiffen, and as Gurt would turn around and go the other way, the guard would relax. The next time Gurt walked towards the guard, he guard wouldn’t tense up quite as much. Eventually Gurt was walking right up to the part of the corridor where the guard stood. Then he walked past him on each turn. First a foot, then another, then three feet, then five. The guard began to ignore Gurt, who appeared to merely be stretching his legs. After several trips past the guard and back, Gurt made his move. He was a few feet from an office, and he suddenly ducked inside it. The guard yelled and ran down the corridor with his rifle, followed by other guards with their automatic weapons lowered and ready. We sat on our bench, stunned, with no idea what was going on, but expecting to see flashes of gunfire and then Gurt’s dead body being dragged out. To our amazement we saw the guards backing out of the office saluting. Then out came Gurt with the police chief. Gurt had his arm around the chief’s shoulders and they were both laughing. They spoke for a few moments and Gurt pointed at us, and a few minutes later we were told we could go, as long as my father came back on Monday to talk to the judge. How did he do it? How did Gurt get us out of that Guatemalan jail, including a minimum of three days incarceration for my father? Certainly Gurt dressed for success. He was also had confidence to spare. But during the next few days I was able to visit with Gurt and find out his secret, and hear his amazing stories. In his younger days Gurt aided the U.S. government to catch drug kingpins, or so he claimed. He told us so many amazing stories we weren’t sure we could believe them, but they were so detailed and told so quickly we couldn’t see how he could possibly be making them up, either. In one story, Gurt arrived at an airport with an urgent need to get to his destination. Without any connections or anyone knowing who he was, he was able to get a private plane that was already on the runway, packed with rich folks and politicians, to turn around and come back to the gate to pick him up. “Who are you?” someone asked in disbelief. He would say it sincerely, earnestly, humbly. He said people would fall all over themselves to assist him. Be sincere. If you aren’t sincere, then asking for help is emotional manipulation. Part of being sincere is exhausting your other options. If you have the power to help yourself then you’re not sincere, you’re lazy. Use the exact words “I need your help.” Saying “I need your assistance,” or “Can you do me a favor?” is not as effective. Don’t overdo it. I don’t ask people for help this way very often. I do it when I have an urgent and important need, and there truly isn’t anyone else I can turn to. I rarely ask the same person for help this way more than once. Be grateful. Nobody likes to help an entitled snob. Help others. If you’re not willing to help others in need, how sincere can you be asking for help? I don’t know where Gurt is today. A year or two after our escapade in Guatemala he called my father and asked him for help. He needed my father to wire $1,000 to a bank account. My father did so, and we never heard from Gurt again. Maybe Gurt went out in a blaze of glory on one last black ops mission. Maybe he was a con-man. If he was, he’s the most amazing con-man I’ve had the pleasure of meeting. Regardless, he got my father out of a Guatemalan jail, he taught me an important life lesson, and I think combined those things are easily worth a thousand dollars.